Home > News > Can you donate Kaukauna’s next Christmas tree? Can you donate Kaukauna’s next Christmas tree? 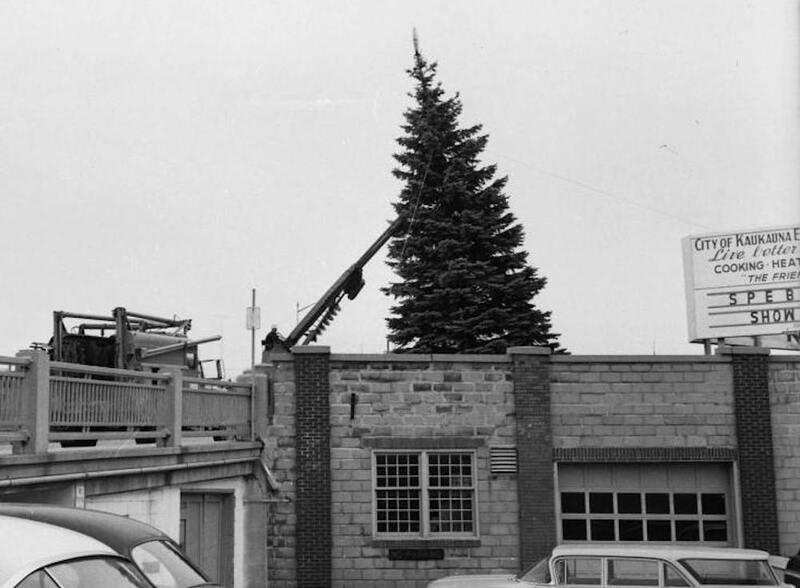 Setting up the city Christmas tree in 1965 on the Lawe Street bridge. Photo posted by Lyle Hansen in the “You know you are from Kaukauna …” Facebook group. KAUKAUNA — The city of Kaukauna is looking for a suitable tree to be placed as the city Christmas tree in Hydro Park near Crooks Ave, according to a post on the city’s Facebook page. The tree will be lit during the Electric City Christmas Parade on Tuesday, Dec. 6, 2016. The donating family will be recognized for their donation. The city will cut the tree down and transport it at no cost, but the owner is responsible for removing the stump at their expense. Ideally, the tree will be 25-30 feet tall and in good condition, fully flocked. If you have a tree that you believe is suitable, contact the Mayor’s office prior to Nov. 11, 2016 at 766-6310 or mayor@kaukauna-wi.org. Photos of the tree are desired.